I’ve always been drawn to artists like Willie Nelson. Artists that are completely themselves and yet also have the ability to navigate the popularity game. 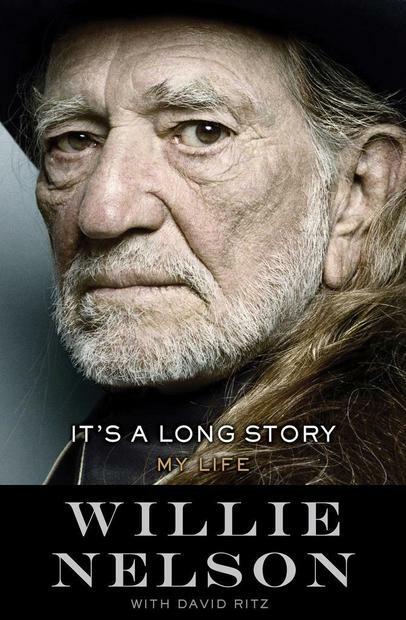 It’s not an easy road to take and Willie Nelson’s new autobiography, It’s A Long Story – My Life, gives a reasonably detailed account of his struggles to make it to where he is today. And where he is, is awfully impressive. As he writes in the Introduction: “I’m thankful that I’m still here. By the time you read this, I’ll be eighty-two. I’m pleased to tell you that since turning eighty, I’ve written a couple dozen new songs, recorded five new albums, and performed over three hundred live concerts. I don’t say that to boast but to reassert my belief that the essence of my work as a songwriter, singer, and performer is based on the simple task of telling stories. Telling those stories has kept me alive.” I can’t imagine doing all of that music making by the time I’m eighty, never mind in a two year period. Willie’s certainly a creative powerhouse. But the book is not all roses and like many artists, Willie Nelson is highly complex. Loving and cruel. A music industry insider and yet a rebel. A laid back homebody and a wandering troubadour. And ultimately, that’s what makes It’s A Long Story – My Life such a fun read. Go buy the book – it’s good.